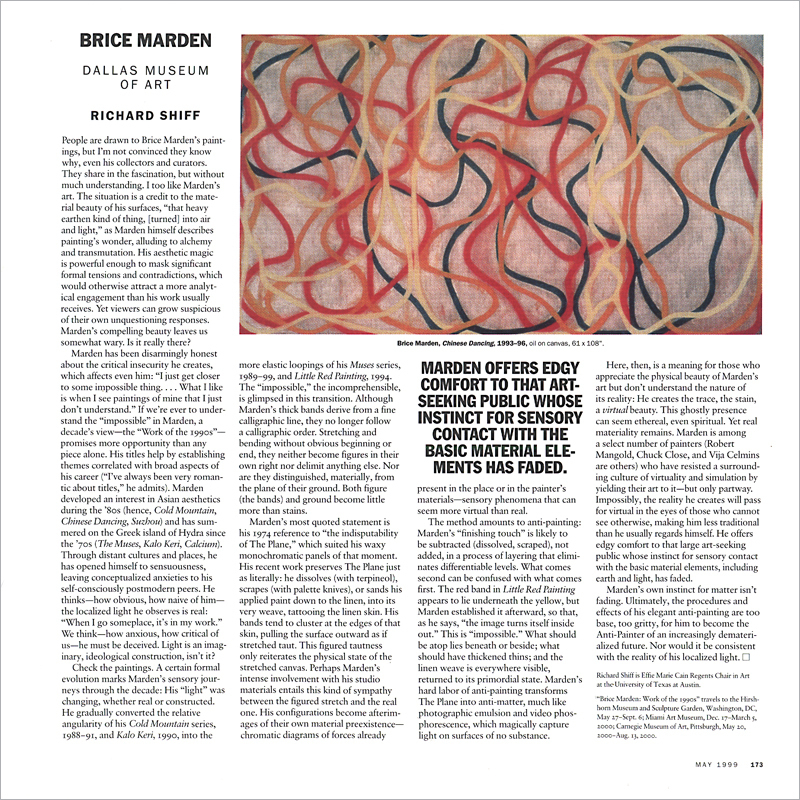 PEOPLE ARE DRAWN TO BRICE MARDEN’S PAINTINGS, but I’m not convinced they know why, even his collectors and curators. They share in the fascination, but without much understanding. I too like Marden’s art. The situation is a credit to the material beauty of his surfaces, “that heavy earthen kind of thing, [turned] into air and light,” as Marden himself describes painting’s wonder, alluding to alchemy and transmutation. His aesthetic magic is powerful enough to mask significant formal tensions and contradictions, which would otherwise attract a more analytical engagement than his work usually receives. Yet viewers can grow suspicious of their own unquestioning responses. Marden’s compelling beauty leaves us somewhat wary. Is it really there? Marden has been disarmingly honest about the critical insecurity he creates, which affects even him: “I just get closer to some impossible thing. . . .